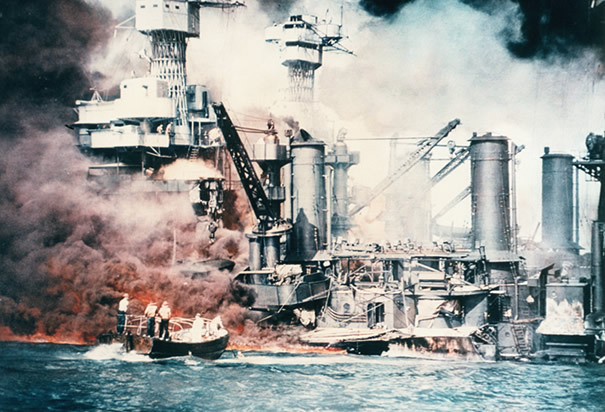 Today, December 7, 2011 marks the 70th anniversary of the Japanese attack on Pearl Harbor; an attack that claimed the lives of more than 2,000 Americans and prompted the United States to enter World War II. To commemorate the victims of the attack on Pearl Harbor, a memorial ceremony will be held today at Battleship Cove in Fall River, Massachusetts. The ceremony is set to begin at 12:55 p.m., which is the time (on the East Coast) when the Japanese commenced their two-hour long aerial assault on the American naval base near Honolulu, Hawaii. Today's ceremony at Battleship Cove will feature Manuel Martin of Westport, who is one of the area's last remaining survivors of the Pearl Harbor attack. A film, “The Pearl Harbor Experience at Battleship Cove” (complete with specialized visual and audio effects), will also be played. Battleship Cove is home to a Pearl Harbor exhibit, which is on the second deck of the USS Massachusetts. Two Pearl Harbor memorials are also on board the battleship: one is inside the BB59 Memorial Room while the other is at Turret Three. The Massachusetts Chapter of the Pearl Harbor Survivors Association dedicated both memorials. The largest Pearl Harbor memorial in the Bay State, however, stretches directly over Battleship Cove. Braga Bridge, which connects Fall River to Swansea via I-195, is named for Fall River-native Charles M. Braga, Jr.
Braga, who was a sailor aboard the USS Pennsylvania, lost his life in the Pearl Harbor attack. He is remembered as the first serviceman from Fall River to die in World War II.